Wikimedia Commons has media related to 1695. 1695 (MDCXCV) was a common year starting on Saturday (dominical letter B) of the Gregorian calendar and a common year starting on Tuesday (dominical letter F) of the Julian calendar, the 1695th year of the Common Era (CE) and Anno Domini (AD) designations, the 695th year of the 2nd millennium, the 95th year of the 17th century, and the 6th year of the 1690s decade. As of the start of 1695, the Gregorian calendar was 10 days ahead of the Julian calendar, which remained in localized use until 1918. It was also a particularly cold and wet year. Contemporary records claim that wine froze in the glasses in the Palace of Versailles. 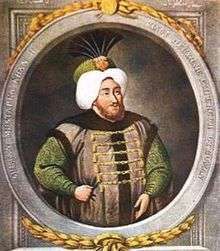 February 6 – Mustafa II (1695–1703) succeeds Ahmed II as Ottoman Emperor. April – The Parliament of England decides not to renew the Licensing Order of 1643 requiring press censorship. June 24 – Commission of Enquiry into the Massacre of Glencoe in Scotland in 1692 reports to the Parliament of England, blaming Sir John Dalrymple, Secretary of State over Scotland, and declares that a soldier should refuse to obey a "command against the law of nature". July 17 – The Bank of Scotland is founded by an Act of the Parliament of Scotland. August 13–15 – Nine Years' War: Bombardment of Brussels by French troops. September 1 – Nine Years' War: France surrenders Namur in the Spanish Netherlands to forces of the Grand Alliance led by King William III of England following the 2-month Siege of Namur. September 7 – English pirate Henry Every perpetrates one of the most profitable raids in history with the capture of the Grand Mughal ship Ganj-i-Sawai. In response, Emperor Aurangzeb threatens to put an end to all English trading in India. English manufacturers call for an embargo on Indian cloth and silk weavers picket the House of Commons of England. After 23 years of construction, Spain completes Castillo de San Marcos to protect St. Augustine, Florida, from foreign threats. In Amsterdam, the bank Wed. Jean Deutz & Sn. floats the first sovereign bonds on the local market. The scheme is designed to fund a 1.5 million guilder loan to the Holy Roman Emperor. From this date on, European leaders commonly take advantage of the low interest rates available in the Dutch Republic and borrow several hundred millions on the Dutch capital market. The Great Famine of 1695–1697 begin in Swedish Estonia and spread across Finland, Latvia, Norway and Sweden. ↑ Palmer, Alan; Veronica (1992). The Chronology of British History. London: Century Ltd. pp. 198–200. ISBN 0-7126-5616-2. 1 2 Williams, Hywel (2005). Cassell's Chronology of World History. London: Weidenfeld & Nicolson. p. 287. ISBN 0-304-35730-8. ↑ Eeghen, I. H. van (1961). "Buitenlandse manopolies van de Amstersamse kooplieden in de tweedee helft van de zeventiende eeuw". Jaarboek Amstelodamum. 53: 176–184.